Friday at work was interesting. You know how you never know who you’ll see at Wal-Mart? I met a famous artist at the self-checkouts on Friday. Specifically, I met P. Buckley Moss. I recognized her initially, thinking, I think that’s P. Buckley Moss, but didn’t ask the question. Then I saw the screen on the pin-pad where she signed. P. Buckley Moss. Wow. I hadn’t seen her in some time. But she remembered me, and also remembered Mom, since both of us went to some of her art signings at her barn in Waynesboro, which is actually a converted apple barn in a nice little neighborhood. That was neat. You never know who you’ll see come through Wal-Mart. I’ve met Reo Hatfield, a Waynesboro city councilman and an instrumental player in the truce between the Hatfields and the McCoys, and I’ve also met Moreko Griggs, who made headlines when he was named as Waynesboro’s first black valedictorian, and then was changed to being one of three valedictorians, next to two white women. That story is outlined here. So all in all, it’s neat. Going through Harrisonburg on my way up to Pennsylvania on Thursday’s road trip, I noticed something unusual out my right window. At the site of the former Howard Johnson’s in Harrisonburg (which, according to both official and unofficial sources, is being upgraded in order for it to be used as a dorm again due to capacity issues), another building had bitten the dust. Recall that on October 9, 2003, I photographed the old Howard Johnson’s as Rockingham Hall – perhaps the last photos ever made of the complex while still whole. Then in June 2004, the unused restaurant was demolished. Gone. I drove by on June 23, 2004, and was shocked. A pile of rubble stood where the restaurant was, including the mangled remains of the cupola. Then this summer, you may recall, the remainder of the complex, meaning the gate lodge and the motor lodge, was slated for demolition. However, the demolition was called off, and the motor lodge building was upgraded slightly for use as a dorm once again. However, the gate lodge was demolished, having been reduced to a pile of rubble. The gate lodge had been done over in the 1990s, and there were even remnants of the blue roof installed at that time (replacing the signature orange roof) visible in the debris. For the back-story on that, JMU learned in 2004 that they couldn’t use the Howard Johnson’s buildings anymore unless they were upgraded to higher standards. Thus the buildings were vacated, because it was not considered feasible to upgrade a building that they bought with the intention of demolishing. Thus, for 2004-2005, the facility was unused as a dorm, and offices housed there were intended to be relocated (no word on how that went). However, capacity reared its ugly head again, since JMU still hasn’t figured out that it’s not a good idea to admit more freshmen than you have space. And I also don’t believe that bunking three people in a room designed for two is a solution, either, even if you do have a suite living room at your disposal. What JMU needs to do is find the funds to demolish the R5 parking lot next to Chesapeake Hall and build the third CISAT dorm that’s in the master plan for the east campus. That would either be three separate buildings of five floors each that are basically single-wing versions of my beloved Potomac Hall, holding roughly 200 students each, or the same three structures as “A”, “B”, and “C” wings connected by low-lying corridors like at Potomac Hall. Which one it’s slated to be depends on whose drawing you look at. But until then, they’re remodeling buildings whose days are already numbered. It looks fairly nice, with JMU putting new furniture, carpeting, and fixtures in, according to some new-freshman literature I found on the Web. One may notice right offhand driving by on I-81 that the sliding doors to the balconies were removed, and replaced with a more conventional glass door with windows on either side. Additionally, new railings were installed on the balconies. And this is going to be a FRESHMAN dorm. I did go out, and I certainly covered some distance! Yes, I did go out on Thursday, and it was quite a road trip, for that matter. I drove up to Pennsylvania and back via I-81. I still don’t understand what Mom’s obsession is with my shoes. After all, I’m an adult, and I can wear what I want, and look as sharp or as dumpy as I want. I decided to go for “casual”, thus no shave and the flip-flops. Still, the objection to it was weird, but expected. But it’s rare that I’ll wear flip-flops. Normally, I’ll wear my chucks or my real sandals (with socks, of course). Never flip-flops with otherwise bare feet. So that was a surprise for Mom, but lately on my off-days when I’m not doing anything too important, I’ll wear that. It’s quick and easy. Moving along, though, I ran this like DC to an extent. But obviously, the destination was not DC this time around. The 10:30 departure, for one thing. Still, I went to Mt. Jackson on the way up and enjoyed some grub at the Sheetz there, which I do on the way up to DC. It was busier there, though, since it was around 11:30 when I got there, vs. 7 AM or so when I go on my DC trips. Rain, thunder, and lightning… that ought to break the heat wave! The last three days in this area have been best described as HOT. The temperatures stayed just barely under 100 degrees, and the heat indexes (i.e. what it really feels like) were well over 100, with Weatherbug showing today’s heat index at 105. I think I could likely cook an egg on the driveway with all the heat it’s absorbed. And now, clouds have rolled in, and thunder and lightning are up to their old tricks again. And it rained a bit. Nothing like a good rain to help dissipate the heat. Hopefully it will cool things off a bit. Now tomorrow, it’s only supposed to get up into the upper 70s. Compared to these last few days, that’s winter-coat weather. And I will welcome it with open arms, since it’s just been awful. And we may recall that my car has no air conditioning, which makes things just awful in there. And I’m still deciding if I want to go anywhere or not, but I think I’m going to go somewhere on Thursday. Today I decided to stay home, which worked out for me, since I’ve been romping around on my little “intellectual playground” of Wikipedia, and trying to get something done on this site as well. 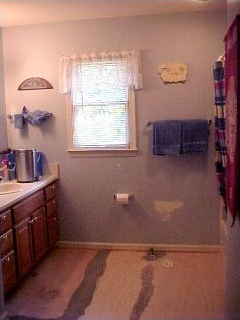 The toilet is in the bathtub! 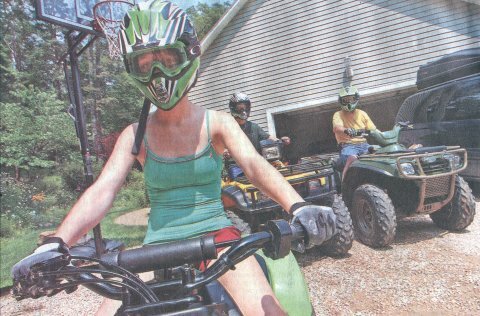 What is wrong with this picture from the Sunday, July 24 edition of the Staunton News Leader? I went to Singles Shopping… or at least tried. 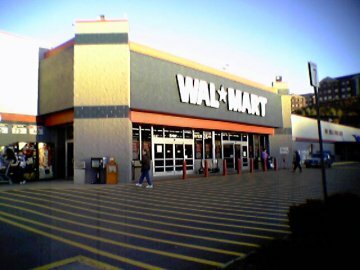 I went down to Roanoke on Friday evening after work to visit the Wal-Mart on US 220, where, you may recall, I wrote in this space about “Singles Shopping”, the place for desperate singles to tie a red ribbon onto their cart and try to find true love. So after traveling 90 miles from Stuarts Draft to Roanoke, I arrived at Wally World way down in Roanoke, only to find out that Singles Shopping was cancelled, and that they wouldn’t be having it anymore. I knew something was up as soon as I got in, considering there was no signage for the event, and saw no red-ribbon carts. I asked the greeter, who, after enthusiastically greeting me with a hearty “Welcome to Wal-Mart!” (major plus points there), told me it was cancelled. Turns out that earlier in the day, the store received a directive from Home Office in Bentonville: Do not have Singles Shopping tonight, and do not have it again. Drat. And I was looking forward to it, too. I, along with several others, put in comment cards about how we traveled distances to see this, only to find it was cancelled. Some even came from West Virginia, though from Roanoke to West Virginia isn’t as far as from Roanoke to here. All the store associates I spoke to were very apologetic about it, from the managers and right on down, since this was their great idea, and Bentonville nixed it (though I was told that some associates absolutely HATED the concept). After all, it got such wonderful press in the Roanoke Times (linked in the first entry I posted on this topic), and via the Associated Press to other papers. Jay Leno even made fun of it on his show. I had fun in DC on Wednesday the 20th. It was a long day, but fun nonetheless. However, the fun didn’t start right away. Oh, no. The drive up to Vienna was “more challenging” than usual. For those of you who don’t know, my car will have been in our family for fifteen years this month. So it’s an old car as these things go. And it’s seen fairly continuous service for those fifteen years. As a result, things start doing strange things as they age. My cruise control can be a little tricky sometimes. When it wants to work, I get up to speed, start it up, and then set it. It will catch, and it will work fairly well. However, other days, it will do one of two things. It will either try to catch and miss, or do nothing at all. In both cases, the cruise control light blinks several times, and then goes out, and the light will not come on again until the car is restarted. The end result is no cruise control until the car has had several hours sitting turned off. So coming off of VA 608 in Fishersville onto I-64, I set my cruise. It caught and we were sailing. Changing to I-81, I always come off of cruise control, since it’s too tight a curve to take at full speed. Then once I get back onto I-81, I set the cruise control back to where it was. And life is good, don’t you see. Today, coming off the ramp and onto I-81, in re-setting my cruise control, it missed. So no cruise for me on the way up! Thus instead of just sailing up there, I was kind of doing an up-and-down thing speeding up and slowing down, since my mind wants to be on cruise control, but my car just won’t agree to it. I’ll get up to the proper speed, and then accidentally let it drop. Not a good thing. So we have to start over, getting to the right speed again. It’s a vicious cycle. After my stops at Sheetz and Wal-Mart on the way up, I checked my cruise again to see if it would come to life again (it sometimes does), but unfortunately no. No cruise for me. Several blinks and then dark. But at least it’s during the day, and I’m still fresh as a daisy. It’s right around 3 PM on Tuesday afternoon, and I’m working the self-checkouts. Then one of our CSMs comes up to me and tells me that I have a call on Line 1. So I get the cashier next to me to keep an eye on the Fastlanes for a couple of minutes while I take that call, figuring it’s probably Mom or Dad with some highly pertinent information or something. It turned out to be a fairly random individual who had heard of me and the Web site and wanted the URL, and knew where I worked. I’m thinking, why are they calling me at work? Mom, Sis, and David Temple (a friend of Sis’s) went to New York City for the weekend, and as is typical of when Mom goes to New York, she asked me if I wanted anything from up there. 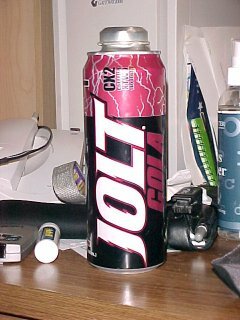 Now if you’ve ever seen the movie Jungle 2 Jungle starring Tim Allen, you know that the chief of Mimi-Siku’s tribe gave him the mission of bringing back fire from the Statue of Liberty. 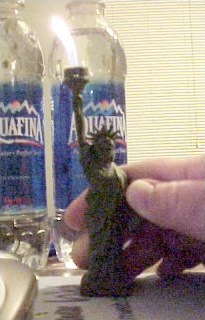 After Mimi-Siku tried to take it literally (actually climbing the statue to physically reach the torch), in the end, he got a lighter shaped like the Statue of Liberty, where the flame comes out of the torch. 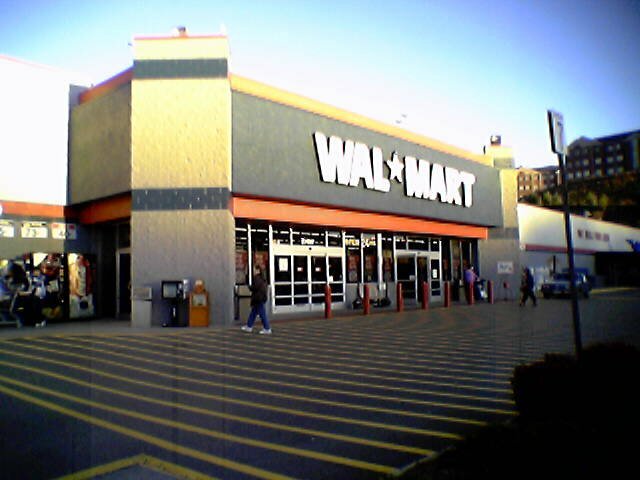 Wal-Mart in Roanoke – the place for desperate singles to meet and greet? 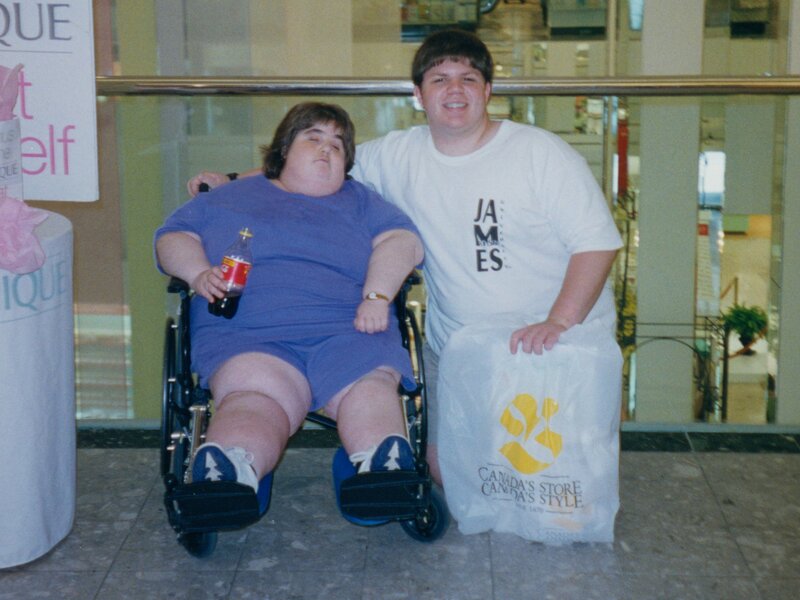 You know what’s so special about this store? Three days of no Internet and four updates ready to go (Photo Feature, Childhood Days, Transit Center, and Journal) will drive a person completely up the wall. There’s just something about knowing that your Internet connection is down that makes you crazy. No Email. No AIM. No forums. No Web updates. Seriously, everything grinds to a halt. Of course, it could be worse. I could be one of those people who do their Web page right on the server, and thus not have a local copy to do. I have the whole Web site right here on my computer, and that’s my “master” for the site. What you see online is simply the latest update from the master on my computer. Still, it makes a person crazy to have all these updates ready to go and nowhere to put them. Hopefully, now that we’ve had the cable guy in to fix it, the connection will stay up. They rearranged how everything was wired together, giving the cable modem its own cable jack and somehow making it work. So I’m pleased. Wednesday and Thursday were such wonderful days off. I ran some errands, ran around a bit, and also got a lot of work done on the computer. On Wednesday, I spent much of the day out. I first went to the RadioShack store in Waynesboro to return that RF switch that I ended up not needing to hook up my Super Nintendo. Interestingly enough, it wasn’t the switch that was the problem, but rather where along the line I was hooking it up. So no problem. The Super Nintendo works, and I got my thirteen bucks back. Then I went over to Staunton. Since the Harley-Davidson shop moved to its new location in Staunton, I’d heard a lot about it. Add to that the fact that they had their first annual “Rally in the Valley” about a month or so ago, and that generated a bit more buzz about it. So I went over to take a look. Now I’d never been to the old Harley place when it was in Waynesboro, so I had nothing to compare this to. Still, I was favorably impressed, even though biker stuff isn’t exactly my thing. First of all, the sense of space really gets you. The place is huge. And that’s not even the whole place. That’s just the main salesfloor. And on the salesfloor, there are bikes on display, there are sections for parts and accessories for one’s motorcycle, sections for men’s, women’s, and kids’ apparel, a section for shoes, a section with hats, helmets, sunglasses, and goggles, and even more. Then on the other side of the building, there’s a service area, and a well-appointed waiting area for people whose bikes are being serviced. And then outside the building, down a hill, is a course for people to take on their motorcycles. With it being down a hill from the main building, it makes for a great viewing area. As I said, I was favorably impressed with the place, even with biker stuff not being my thing. The place is very high-visibility (it rises high above the VA 262 loop), but actually getting to it is a little weird, since you have to go south on US 11, turn left onto Rolling Thunder Lane, which is almost right after you get onto Route 11. Then Rolling Thunder Lane is a longish, slightly-curving road with the Harley place looming up at the end. 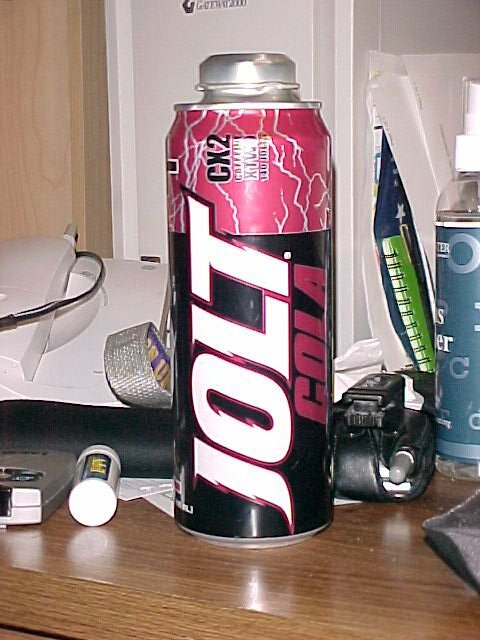 Jolt Cola: It really does exist! Of course, the reason people buy condoms through the self-checkout in the first place is to be discreet. They don’t want anyone to know that they’re buying condoms in the first place. This, by the way, is how retail employees have lots of fun doing their jobs. We are completely following established procedure, and laughing like heck on the inside the whole time. Person rings up condoms on the self-checkout. They put it in the bag. The self checkout machine goes off: “Item not recognized! Remove last item and try again!” So I come over. Me: “Hi, let me fix you up so you can continue.” I look into the bag (so as to visually verify that the items match their ticket). I see the condoms. I don’t say anything, but you can tell that they’re completely embarrassed by it. I’m laughing on the inside.